Hi loves! 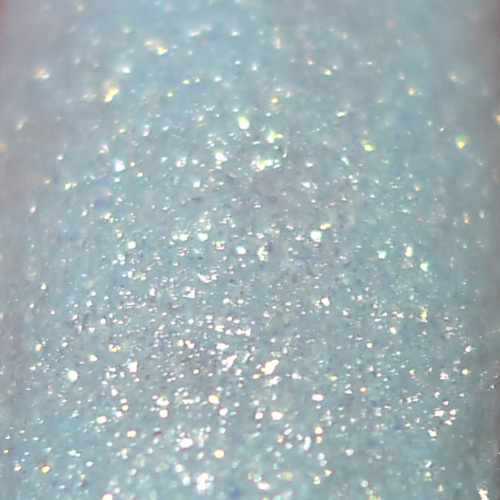 Sorry for the delayed post, I just didn't have time to prep one for today and just finished swatching and reviewing the polishes I am showing you today :-). 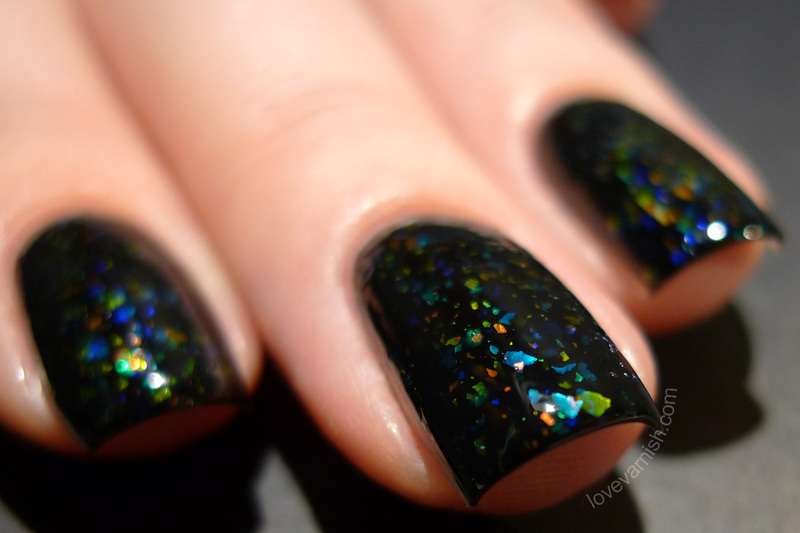 I want to introduce you to the Anna Gorelova by Dance Legend collection. Anna Gorelova is a Ukranian blogger with perfect nails and photographs. She makes each and every polish look perfect, so you might want to check out her blog (but watch your wallet ;-)). A while back she released a 12 piece collection she created together with Dance Legend. I got to pick 3 shades from it and I went with 05 Лебёдушка, 11 Мавка and 12 Змей Горыныч. She really created some fun and original shades, so let's take a look at them! First up is 05 Лебёдушка, a baby blue texture that looks light as air. Unfortunately, this was also the one I had most trouble with. You are looking at 2 coats over Essence Studio Nails 24/7 Nail Base. My first coat was a bit thinner but also more patchy, I used a thicker second coat to even it out, but it took quite a while to dry to a proper textured finish and also it didn't level completely. It looks totally dreamy though - the shade of blue is just perfect and the golden sparkle lights it up beautifully. 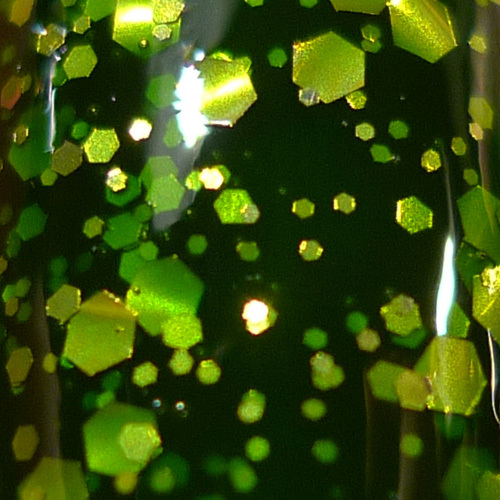 Next is 11 Мавка, a green jelly base filled with 3 sizes of golden green hexagonal glitter. I chose to layer this because I can't wrap my tips properly with a glitter filled polish, so I used Catrice Hugo Moss for that purpose. I applied 2 coats of this beauty and it has such lovely depth! The glitter plays nicely, it doesn't clump nor do you have to work it real hard for good placement. It might look like it's curling, but that's reflective curling. Smooth with a layer of top coat! Last but not least, 12 Змей Горыныч. 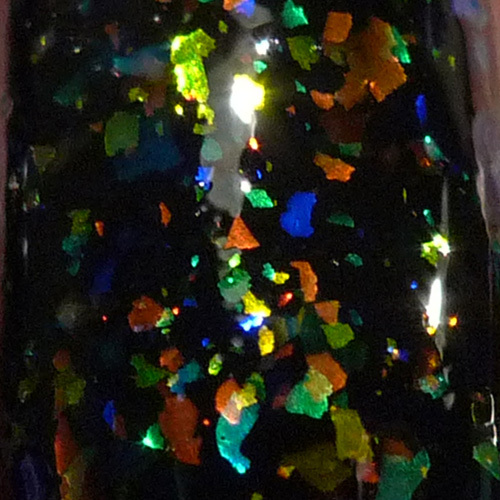 This black stud has multicolored flakies! Again, to wrap my tips I started with a basecolor first, a simple layer of a england Camelot. 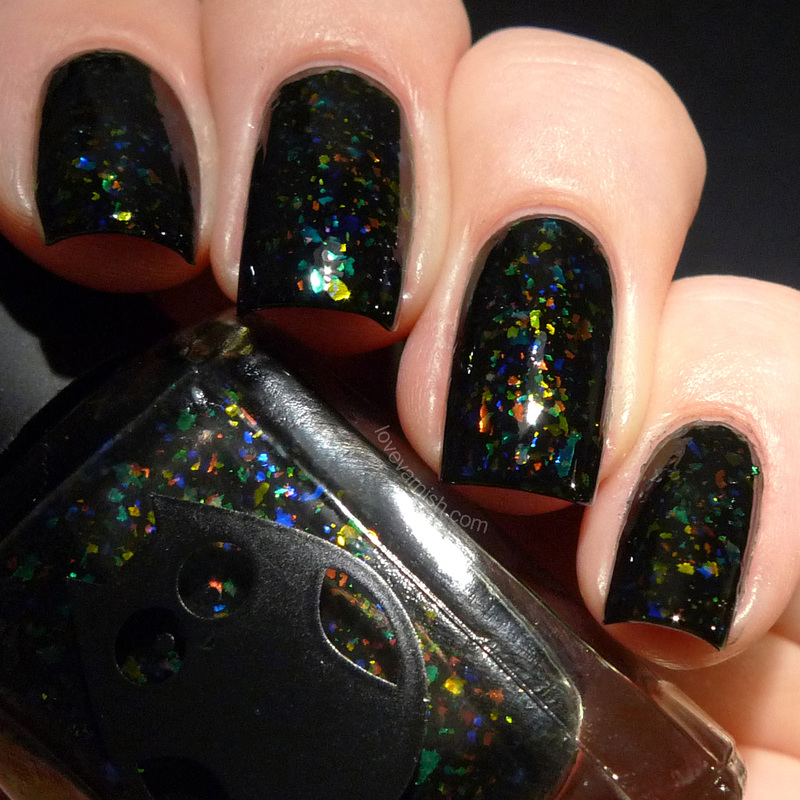 Then I used 2 coats of this pretty thing and topped it with top coat. It isn't difficult to use, just make sure you add some flakies in the spots you might not have covered when applying it regularly. The flakies lay flat nicely and there are so many colors! It isn't as bright in regular lighting but still very pretty. What do you think of these shades? And which is your favorite? Tell me in the comments! Dance Legend is sold through their own webshop. 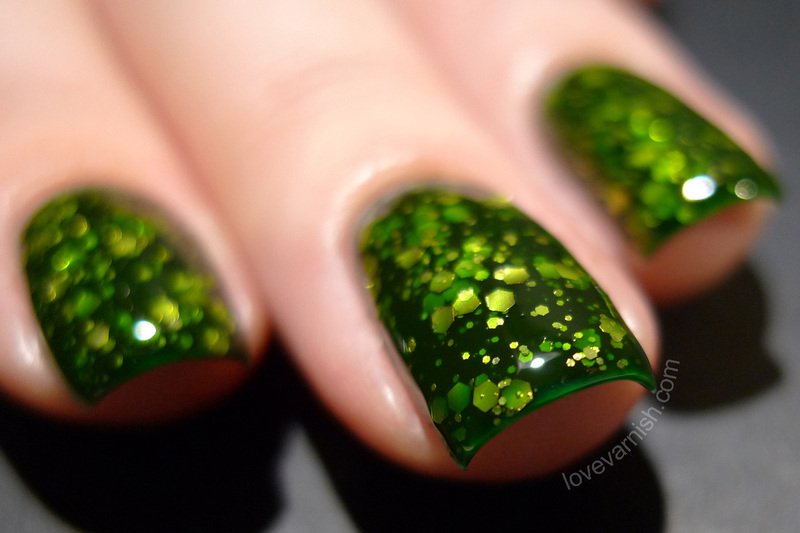 Anna Gorelova by Dance Legend shades come in 12 ml. bottles and retail for $10. Shipping worldwide is $10 and free if you order over 10 bottles. Мавка and Змей Горыныч are my picks, too! (and so sweet of you to write the names in Russian!) And I also bought #03 - The Gold Fish (it is very sheer but a super pretty warm beige gold scattered holo - similar to their Wow Prizms). I think this whole collection is absolutely amazing. From the inspiration - Slavic folklore and our fairy tales - to the lovely bottles with the owl - to the polishes themselves. (The only thing that could be really improved is the names's English translation in the site, some of the names were hilariously poorly translated). 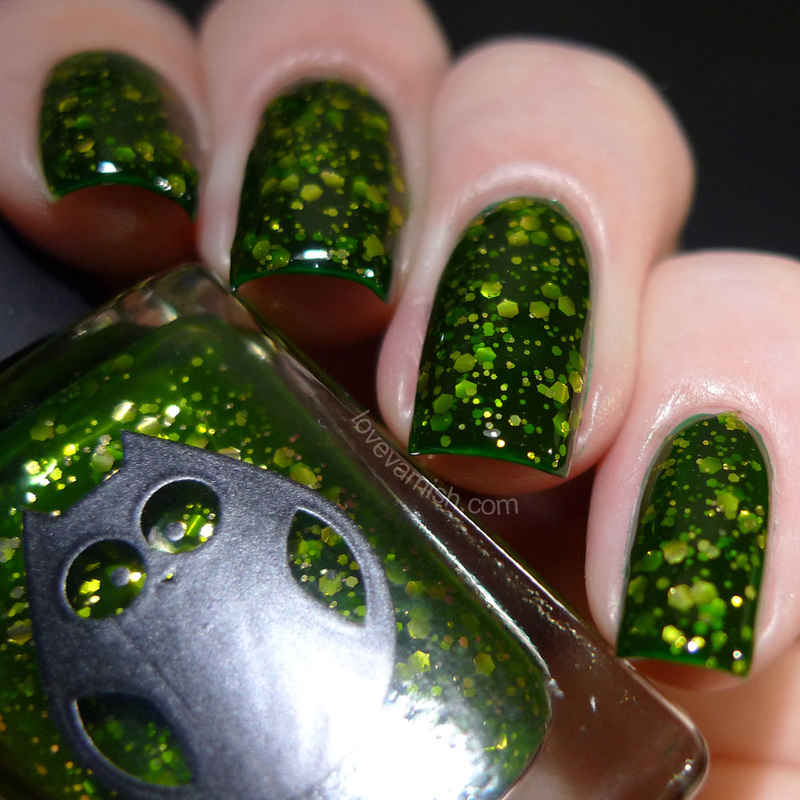 That green polish is so pretty! I think you should consider changing the name of your blog to "Enable All the Dance Legends!". LOL! Gorgeous, per usual! Yes, I tried to read up on the inspiration but Google Translate didn't really capture the essence. I am happy to have you as a reader and commenter because now I'd love to hear about the English names and inspiration behind them from you! And I might end up getting a few more of these - I love the little owl on the bottle as well! :D it's a true stunner! ♥ you are too sweet Em. Haha, I am glad you like my posts so much! But it's hard not to like these lovely polishes ;). It's a true must have then! It is my pleasure to tell about a piece of our culture. 01 Tsarevna Lyagushka (Frog Princess) - in Russian tale, it is a princess who was turned into a frog by an evil charm but who can be set free by a kiss. 02 Alenushka (that's a name, diminutive from Alyona = Elena) is a brave girl who saves her brother turned into a baby goat by an evil charm. 03 Zolotaya Ribka (Gold Fish) is a magical fish who can fulfill wishes if you catch her - our version of a djinn in a bottle. 04 Chudo-Yudo is one of the most mysterious characters of our tales. It is a beast (usually evil) that looks like no other living creature. 05 Lebedushka means Swan Princess - a beautiful and powerful sorceress who can turn into a swan. 06 Zhar-Ptica (Firebird) is somewhat close to phoenix - a bird that burns like a flame. Usually a protagonist receives a quest to get the Firebird, since her feathers give light and contain magic. 07 Kot Bayun (Cat Bayun) is a giant evil cat who has a magic hypnotizing voice. He makes his victims asleep by telling them tales and then eats them. 08 Vodyanoy (Merman) is the king of all underwater creatures. Usually he is an evil character, he tries to steal people to make them live in his underwater word. 09 Vasilisa is one of the most popular names for a heroine (the other one is Elena) - a beautiful and smart princess kidnapped by Koschei or Zmei Gorinych. 10 Koschei Bessmertny (Koschei the Deathless) is the main antagonist in our tales. A very old man (sometimes depicted as an alive skeleton) who cannot be killed. The only way to defeat him is to find and destroy his death. Usually it is said that this death is hidden in the needle point, the needle is in an egg, the egg is in a duck, the duck is in a hare... well, it looks like a big and bizarre matryoshka (you know those Russian nesting dolls?) hidden in a far away island. 11 Mavka is actually a character from Ukranian, not Russian tales (by the way, Anna Gorelova is Ukranian) - something like a mermaid, but she lives in rivers or swamps. She may seduce unlucky men and allure them underwater. 12 Zmey Gorinych is an evil and cunning 3-headed dragon, another common antagonist (together with Koschei) in most tales. Thank you so much for taking the time to explain each single shade! I really like the stories behind the shades I picked and think it actually matches with the polishes really well :).